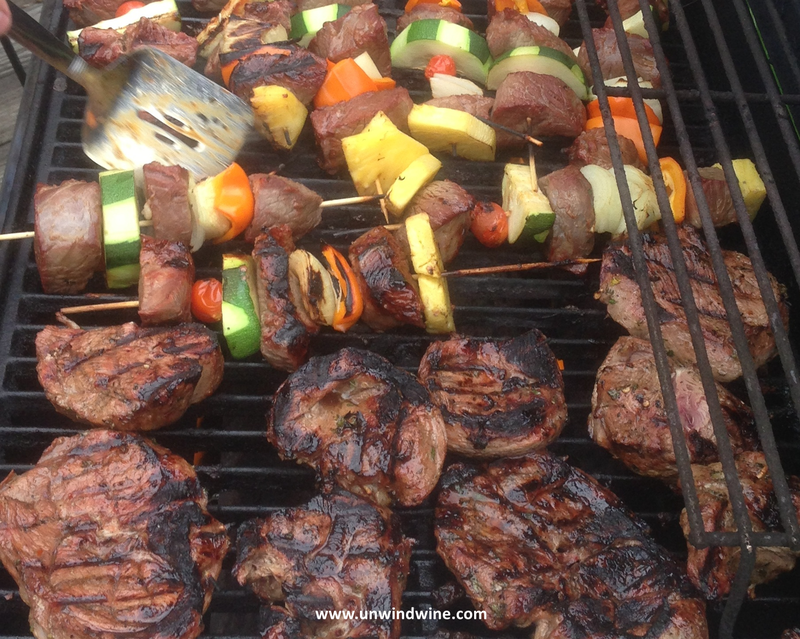 It started with our anniversary celebration dinner a couple weeks ago when we ordered Pride Mountain Cabernet Sauvignon from the Sullivan's Steakhouse winelist. 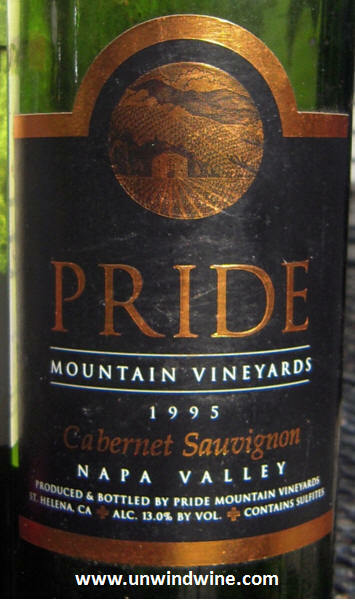 We enjoyed the Pride so much we decided then we'd pick up from there with a follow on tasting of Pride from our cellar. 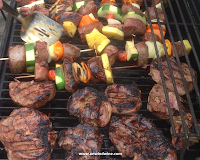 So when our visit from Ryan and Michelle and baby Marleigh grew into a family and friends holiday weekend barbecue, the tasting plan started there. 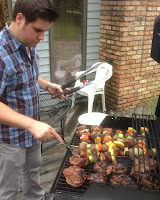 Joining us were Johnny & Erin, neighbors Matt & Amy, Bill and Beth, and later, Dr Dan & Linda. 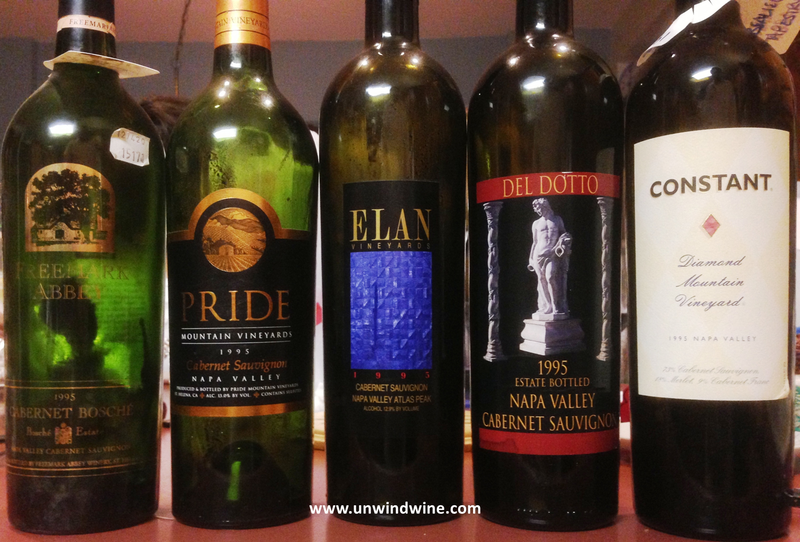 Our collection of Pride Mountain Vineyards Cabernet Sauvignon includes an abundance from the 1995 vintage whose time has come to drink so we set upon a horizontal tasting flight from that year. Adding to the Pride, we pulled from the cellar Del Dotto and Elan. Bill and Beth joined and Bill brought from his cellar Constant Diamond Mountain and Freemark Abbey Bosche Vineyard cabernets from the same vintage to round out the horizontal selection. Prior to dinner we had a selection of artisan cheeses with shrimp cocktail brought by Bill & Beth, with a Carmel Road Chardonnay. The cheese flight highlighted the chardonnay as well as the cabernets. 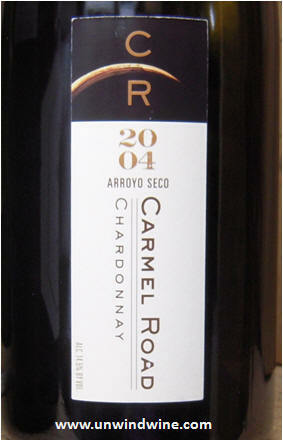 Lemon colored, full bodied, complex citrus flavors with a buttery nut layer. Probably held on to this too long as its past its prime and time to drink. 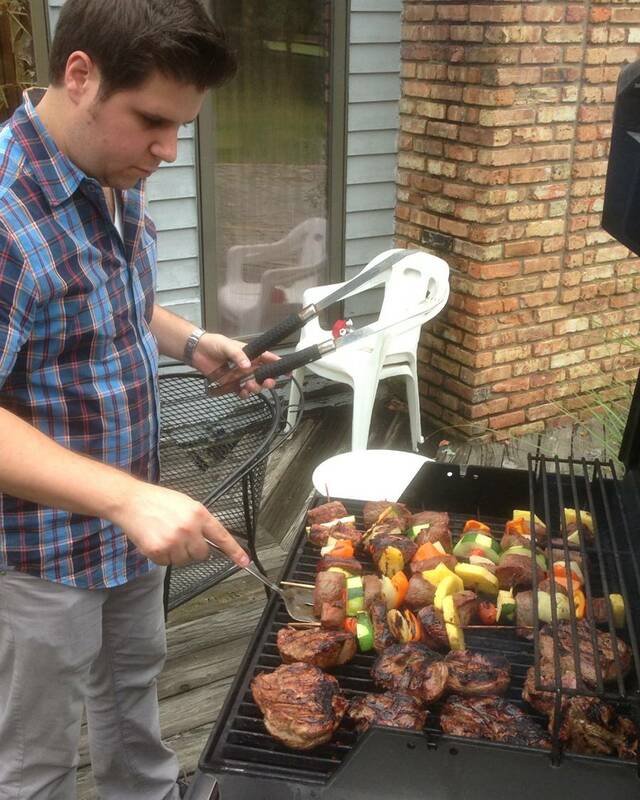 We grilled out steak kabobs, Ryan and Michelle brought a full side of lamb, and Bill and Beth brought New York strip and filet steak. Dan and Linda showed up later and Dan brought two big reds befitting a big Cab tasting, an Amarone from Villa Mattielli and a La Mitre Chateauneuf du Pape from Caves St Pierre. We first tasted and picked up this wine from the producers Richard & Linda Elliott-Smith during our 1998 Napa Wine Experience. Of the five eighteen year old '95 Napa Cab's tasted, this was the one showing the most diminution from age. Full bodied, with firm but well integrated tannins, the black berry and black cherry fruits are falling off a bit and giving way to tones of leather and tobacco, accented by anise, cedar and oak. Showing a hint of age but still life left in this eighteen year old - dark garnet color, medium-full bodied, hints of oak accent spicy forward black berry, black cherry and plum fruits with hints of cedar, leather, cigar box and vanilla with well-integrated tannins on a long complex finish. From high atop Diamond Mountain at the northern end of Mayacamas Range above the town of Calistoga, Fred and Mary Constant and consulting winemaker Paul Hobbs produce Bordeaux style red wine blend wines. 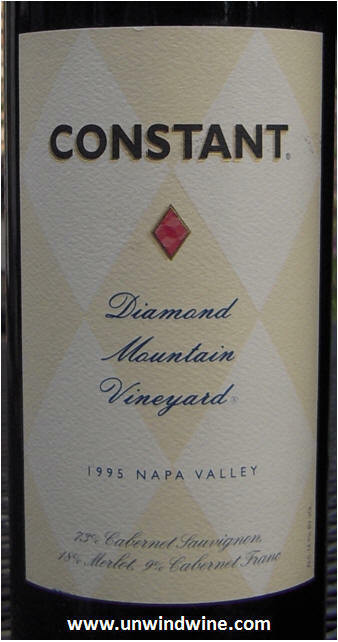 We visited Diamond Mountain and Constant Diamond Mountain Vineyard during our 2011 Diamond Mountain Napa Valley Wine Experience. Sitting at the summit at the top of the mountain, the site offers spectacular views overlooking both Napa and Sonoma highlands from over 2100 feet elevation. Constant is among the oldest wineries in the valley with history dating back to the late 1800's. Wow, what a surprise, we had tasted this wine previously with uninspiring results. Tonight, this wine overachieved, vastly exceeding expectations. Dark purple color, medium to full bodied, full forward flavors of black berry, raspberry and black cherry fruits with traces of anise, tobacco, tea and leather on a lingering, moderate, soft tannin finish. Deep indigo color in the glass. A bit more full bodied than I remembered. Deep flavors of dark berry...blueberry, dark cherry and raspberry, with some minerality on the finish. Not surprising, given this vintage was made in more of a Bordeaux blend style albeit a bit Cabernet heavy at (73%). Smooth integrated tannins. A nice bottle drinking at peak. Will last another couple of years but why wait? Blend of Cabernet Sauvignon 73%, Merlot 18%, and Cabernet Franc 9%. Bill's tasting notes as posted on Cellartracker - "Medium garnet color. Spice on the nose...some pepper and a bit of clove. Full bodied with a interesting layers of plum, cassis, chocolate and eucalyptus. Just a hint of vanilla from light oak. Soft, integrated tannins provide some backbone. This is always a favorite and is drinking very well. 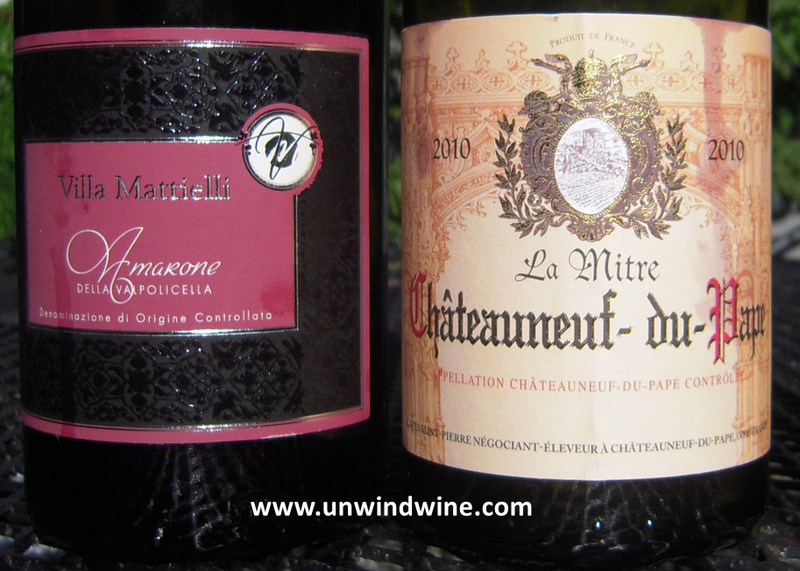 More than held its own against a flight of '95 reds including Élan, Constant Claret, Del Dotto and Pride." Another eye-opening standout of the evening, this was medium to full bodied with bright vibrant forward ripe plum and black raspberry fruits accented by tones of currant, clove, hints of vanilla and sweet oak with smooth polished silky tannins on the finish. We visited Pride Mountain Vineyards and Winery high atop Spring Mountain of the Mayacamas Range overlooking Napa Valley to the east, and Sonoma Valley to the west during our Napa Valley Wine Experience back in 1999 and again in 2003. We've enjoyed Pride since and often 'gift' Pride to friends on special occasions. We're big fans of rich concentrated extracted mountain fruit and hold Pride Cabernet going back to the mid-nineties. We love the Spring Mountain expression of terroir which I believe is as complex and flavorful as the other popular mountain appellations. Dark, full bodied, firm, initially closed and tight - decanted and set aside, after an hour and half it started to open up to reveal big full complex dark blackberry and black currant fruits accented by anise, with hints of spice, dusty cedar, and a subtle sweet dark mocha on the full firm lingering tannin finish. Dan brought this CDP from the much heralded blockbuster 2010 vintage. Garnet colored, medium bodied, surprisingly light for such a hearty vintage, slightly earthy black cherry, leather and tobacco notes with modest tannins. 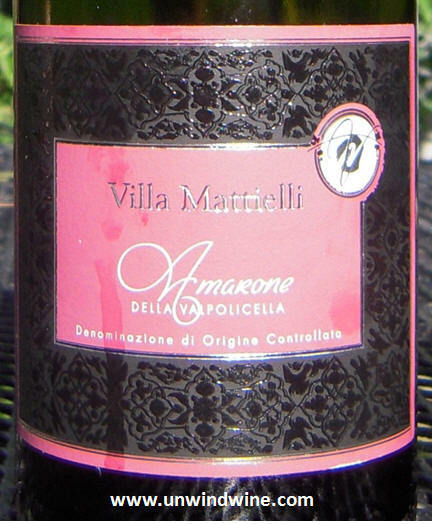 Lacking the big body and complexity of an Amarone, ruby colored, medium bodied, still has that signature raisin and fig tones with hints of anise, cola, vanilla and nut on a modest tannin finish. While it was getting late for some, (Erin & Johnny and Ryan & Michelle set out to get grandkids home and to bed, and Amy was bidding farewell for the evening, wishing to head home, I held her hostage until she'd tasted a dessert wine), mid-way through the evening we opened a Ruster Ausbruch with chocolate, cheese and fresh fruits course. 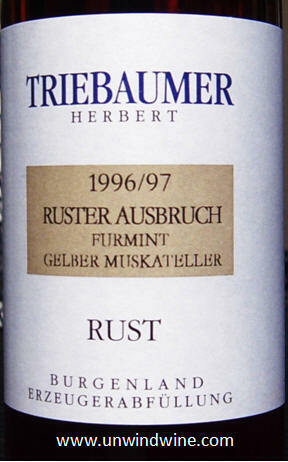 This is a Chardonnay blend of Fürmint and Gelber Muskatellier (Furmint and Gold Muscatel grape varieties). While this was no doubt straw colored upon release, over time it darkened to butter color, then weak tea colored, eventually darkening to the dark orange rust color it possesses now. Allowed to continue to age, this will likely eventually darken to dark strong tea color, although I suspect it won't necessarily improve the flavor and suitability of the wine. Some classic dessert wines are built to last decades, I suspect this Ruster Ausbruch is at or even past its peak drinking window. We still have a case of this wine, so watch this blog as we monitor this over the coming months and years. The thick almost syrupy extracted sweet fruit has been offset by a smoky almond nut flavor. Rather than the highly desirable apricot or peach flavors, this tended to be more cirtus focused. This was a great complement to hard Parmesan cheese. Later, deep in conversation solving the world's problems, I had long ago cried 'Uncle', as by this time my pallet or discrimination for tasting wine was gone and I was done tasting for evening. 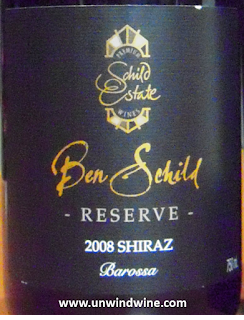 Linda, having not kept pace wanted another glass of wine so opened one of her favorites, a big Aussie Shiraz. The story of the controversy of this label are chronicled in an earlier blogspot posting. The colour of this Reserve was deep dark Ruby Red and inky purple. Big, forward, thick, chewy, almost tongue-coating with huge aromas of blue fruits and violets give way to bright vibrant concentrated tongue coating flavors bursting with blueberry, black raspberry, ripe plum and chocolate, with hints of black pepper, spice and nicely integrated oak on a long lingering soft tannin finish. My earlier review gave this 93 points (with a footnote of possibly warranting a 94) ... this time there re-emerged a bit of a graphite tone which detracted somewhat from the fruit so I took off a couple points.